LiSO films are made either by the dry (DP) or wet process (WP), consisting commonly of extrusion, casting, and orientation units. LiSO DP extrudes polymer melts via a film die to produce membranes or oriented films; they are clear, opaque or porous in character. The DP is beneficial in that no solvents are required. Our dry films are thus eco-friendly, composed often of finely dispersed multiphase morphologies with superior strengths at an extremely thin gauge. The WP, on the other hand, is primarily used to produce porous film products, by employing thermally induced phase separation (TIPS) and nonsolvent induced phase inversion (NIPI) techniques. LiSO WP extrudes mixtures of polymers and diluents, which upon exiting a film die, cools into a cast sheet of phase-separated morphology. 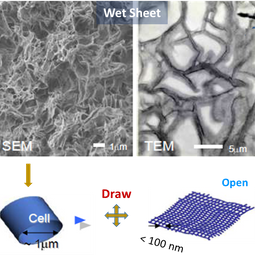 The sheet is then stretched and extracted, to produce the oriented film of a porous structure. Our wet films deliver superior strength, porosity, uniformity, and extremely high resistance to heat, voltage, environment, and chemicals. LiSO porous films provide an open or closed pore structure. The voiding mechanisms may vary to an extent with processes, but generally involve failure at interfaces. 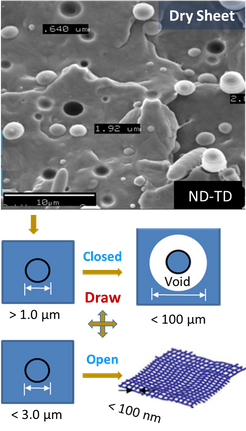 The DP creates pores into the matrix through cavitation and interfacial cracks, by controlling such parameters as compositions, adhesion, crystallization, layer structures, and materials/ process conditions. The WP, on the other hand, requires more steps for creating interconnected pores into the film, i.e., phase separation including nucleation and spinodal decomposition, failure at interfaces, and/or fibrillation, through a deliberate design of materials and process conditions. LiSO is capable of creating a wide variety of nano- and microporous polymeric films. LiSO is specialized in flat film products. Our long-standing expertise ranges from concept to commercial deployment of a wide variety of performance plastic films, along with extensive know-hows realizing breakthrough products. US 9,694,344; US 2018/0043656; US 2018/0065105; etc.